Dietrich Bonhoeffer (4 February 1906 in Breslau – 9 April 1945 in Flossenbürg concentration camp) was an important Lutheran pastor from Germany who was killed by the Nazis during World War II. He is known partly for his belief that killing Adolf Hitler was a moral act. In his early life he believed that all Jews should turn into Christians, but supported them anyway. He disagreed with the general anti-semitism and so created a theological college. He wrote a book called The Cost of Discipleship about following Christianity. Two days after Hitler became Chancellor, Bonhoeffer made a radio speech against him. Later, with Martin Niemöller and others, he started the anti-Nazi Confessing Church. 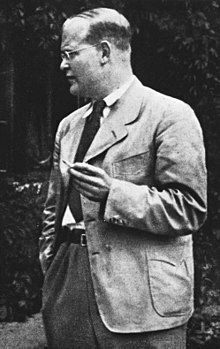 Eventually he became part of the attempt by Claus Schenk Graf von Stauffenberg to assassinate Hitler, but was arrested and executed, seven days before Hitler killed himself. He was hanged days before the liberation of the POW camp where he was imprisoned. ↑ "Dietrich Bonhoeffer". www.jewishvirtuallibrary.org. Retrieved 2017-04-27. ↑ "The Awe-Inspiring Heroism of Dietrich Bonhoeffer". National Review. Retrieved 2017-04-27. This page was last changed on 25 January 2019, at 03:18.